Following in Caroline's footsteps, I'm going to share my holiday wish list for this year. Wintertime is always my favorite because it means a few things: Christmas (my second favorite holiday, haha), my birthday (my first favorite holiday), and mostof all, presents! Here are some of the things that I'm lusting after this year. 1. Ever since I stopped biting my nails, I've been trying to keep them painted so I don't get tempted. I'm OBSESSED with Chanel nail polish. It's like a party on your nails. My favorite color is Peridot. Although, I wouldn't say no to Black Pearl, Particuliere, Mimosa, Vendetta or Rose Exuberant either! 2. Next on my list are these Pamela Love earrings. They are weird and non-descript (in a super shiny awesome way) enough to wear for every day, but still special enough to wear at night. 3. 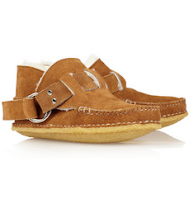 I'm also with Caroline on that shearling lined slippers are a holiday must. 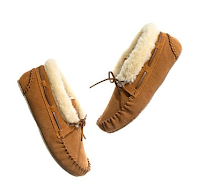 I've been trying to find ones that I'm okay with wearing out of the house so I don'tlook like a hobo and I settled on either these ones from Madewell (right) or these ones I found on Net-a-Porter (left). 4. Last, but definitely not least, is the bag that I've been pining over for the last million years (and by million I mean since seventh grade). 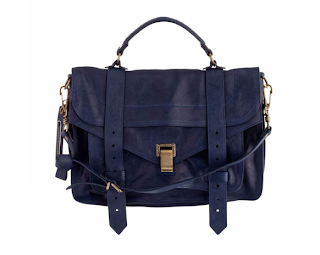 The crown jewel of my wish list, this Proenza bag is perfectly perfect in every way. Basically I'm in love. With a purse. I've decided on classic navy leather, although I was tempted by a raspberry suede one for a while. Maybe I'll get it when I turn 21? A girl can dream.